Students Defeat Staff in Dodgeball Intramurals! Intramural dodgeball started on the 20th of September. The grueling competition started out with twelve teams. Every Tuesday and Thursday they battled it out to make it off to the playoffs and eventually to the championship to play against the staff. The winners received championship shirts and bragging rights. off with team 5 (Arguably the Best) and Team 6 (The Iron Men) fighting for victory. Team 5 won and progressed to the play offs. Team 7 (The Chicken Nuggets) and team 8 (OG Ballers 4 Life) faced off and OG Ballers 4 Life took the win. 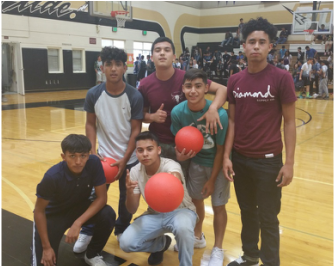 In the 5th game team 9 (Suave) and team 10 (Swole-diers) battled it out.Team Suave proved to be the best and advanced in the competition. In the last qualifying round team 11 (Hot Fire), blazed team 12 the (Spiders) and moved on. The qualifying teams competed in the play offs, after play offs the two remaining student teams face off with the staff teams.In the first game Suicide Squad beat the Average Cobras and moved on. In the next game OG Ballers 4Life dodged a bullet by securing the win against Arguably the Best. Next Suave won the game against Hot fire and advanced to the final play off games. In the last two play of games OG Ballers 4life won against Suicide Squad, and in the final game OG Ballers 4life played Suave and Suave won the game. Suave went on to play the staff team, Pelotas de Furioso. The game ended quickly, Suave attacked fiercely and defeated Pelotas de Furioso. In the last and final game the staff team The Underdodge became the underdogs, team Suave took the title of BC dodgeball champions!